Hebron, occupied Palestine – Palestinians living in the Israeli militarily occupied West Bank face discrimination, racism and humiliation at the hands of Israeli forces on an everyday basis. Humiliation is entrenched in every aspect of daily life under the Israeli occupation. The message is clear: as a Palestinian you are always perceived as a threat, a possible terrorist or a menace – but never as a human being. Syria has called on the UN Security Council to take immediate action against recent US-led airstrikes that killed three Syrian soldiers. The Syrian Foreign Ministry sent a letter to the UN Security Council and Secretary General Ban Ki-moon on Monday, condemning the airstrikes that killed the Syrian government soldiers on Sunday. Damascus said four US-led coalition warplanes fired nine missiles at one of the Syrian army’s posts in the central-east of the country in Deir Ezzor Province, killing three soldiers and injuring 13 others. “The Syrian Arab Republic strongly condemns this flagrant aggression by the US-led coalition forces, which blatantly violates the objectives of the UN charter,” the letter read. The Syrian government has repeatedly condemned the US-led airstrikes in the Arab country as illegal and ineffective with the letter saying the recent attack once again showed the failings of the coalition’s operations. “The US coalition lacks the seriousness and credibility to effectively combat terrorism,” the letter added. The so-called Syrian Observatory for Human Rights, which is based in Britain, earlier said the US-led attacks killed four Syrian soldiers near Ayyash town. A spokesman for the US-led coalition denied responsibility for the attacks and said the coalition hit an area 55 kilometers away from a Syrian army camp. “There were no human beings in the area that we struck yesterday, all we struck was a wellhead,” the spokesman also said. The air raids in Syria are an extension of the US-led aerial campaign against alleged Daesh positions in Iraq, which started in August last year. Many have criticized the ineffectiveness of the raids. This is while the US and some of its regional allies, including Turkey, Saudi Arabia and Qatar, have lent staunch support to the Takfiri groups there. Syria has been gripped by foreign-backed militancy for four and a half years. More than 250,000 have lost their lives and millions displaced as a result of the crisis in the war-torn Arab country. Private US donors are massively funding Israeli settlements by using a network of tax-exempt nonprofits, which funnelled more than $220 million to West Bank settlements in 2009-2013 alone, a Haaretz investigation has found. The funding is being used for anything from buying air conditioners to supporting the families of convicted Jewish terrorists, and comes from tax-deductible donations made to around 50 US-based groups. Nearly 80 percent of this income (about $224 million) was transferred to the occupied territories as grants, mostly through Israeli nonprofits. In 2013 alone, these organisations raised $73 million and allotted $54 million in grants. A senior White House official told Haaretz that “the policy of every administration since 1967, Democrat and Republican alike, has been to object to Israeli settlement beyond the 1967 borders. RAMALLAH – An Israeli military court on Sunday evening sentenced member of the Palestinian Legislative Council (PLC) Khalida Jarrar to 15 months in prison. Ofer military court gave Palestinian lawmaker Khalida Jarrar a 15-month prison sentence for purely political reasons, according to her husband, Ghassan Jarrar. Jarrar was arrested by the Israeli occupation forces from her home in the West Bank town of al-Bireh, on 2 April 2015. The Israeli government charged her on 12 accounts, and after 25 court hearings, the prosecution and the court settled on three main charges: Providing assistance to the Popular Front for the Liberation of Palestine (PFLP), incitement against Israel, and membership in the PFLP. Jarrar is a prominent and inspirational leader in Palestinian society. In addition to being a lawmaker, she is a women’s rights activist and a member of the board of directors for the Addameer Prisoner Support and Human Rights Association. Addameer reported in November that the Israeli military prosecution relied on alleged secret material to maintain leverage during the trial proceedings in Jarrar’s case. Jarrar was placed under administrative detention based on “secret material” from the day she was arrested. Addameer also said that Israel used “fabricated charges” against Jarrar obtained through “deceptive and flawed interrogation techniques” that were used to force confessions from Palestinian detainees. The witnesses later denied the confessions, which they said were given under duress. Jarrar’s husband told al-Araby website that the Israeli police had been exhausting his wife by transporting her from prison to court nearly 25 times in the past few months. Jarrar is detained in Hasharon prison where Palestinian women are mainly held. Her husband is not allowed to visit her on “security” grounds. Jarrar had also been targeted by forced displacement to Jericho from Ramallah by an occupation military order, which she succeeded in defeating after a month-long sit-in at the PLC office and an international support campaign. “The conviction of Khalida Jarrar comes as no surprise; Israeli military courts serve no function except as an instrument of repression and suppression directed against Palestinians. Khalida Jarrar is a Palestinian political leader and an internationally-renowned struggler for justice. She has dedicated her life to working for freedom for her people and her land, and especially for the freedom of Palestinian political prisoners,” said Charlotte Kates, coordinator of Samidoun Palestinian Prisoner Solidarity Network. “It is urgent that we build the movement internationally to demand freedom for Jarrar and for her nearly 7,000 sisters and brothers held as Palestinian political prisoners inside Israeli jails,” Charlotte Kates added. It was obvious even at the time the Obama administration’s anonymous threats to reconsider its diplomatic protection of Israel were nothing more than posturing. Netanyahu had broken an unwritten rule when he said in front of the cameras what is stated in his Likud party’s platform: “The Government of Israel flatly rejects the establishment of a Palestinian Arab state west of the Jordan river.” Not only had this been written policy since 1999, but Netanyahu’s government – and every other Israeli administration since the state’s illegitimate formation in 1948 – has been carrying it out in practice. Obama has demonstrated little interest in supporting progressive policies in favor of human rights and social justice, but he has shown himself zealously concerned with them in the abstract through grandiose and noble rhetoric. During the first six years of his presidency, Netanyahu actively opposed a Palestinian state without Obama’s administration withholding any of the ideological, diplomatic, military and economic support that is a necessary condition for the occupation’s survival. As long as Netanyahu kept quiet, Obama could pretend his administration’s support for Israel was contingent on Israel seeking a permanent peace deal with Palestinians. This week, we’re featuring images that show how global warming has already impacted the world. Packed shoulder to shoulder, an estimated 35,000 Pacific walruses congregated on Alaska’s northwest coast near Point Lay last fall. Normally the mammals find ocean ice sheets to rest on, but as waters have warmed the ice sheets have disappeared. 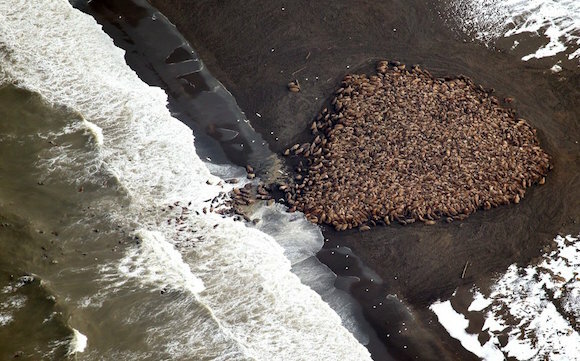 In seven of the last nine years swarms of walruses swam ashore for refuge, as shown above, according to the U.S. Geological Survey. The first time this happened was in 2007 when summer ice levels were at a record low. The Times is peddling ignorance here. Actually, the congregation of walruses on land is an age-old phenomenon known as “hauling out.” It has nothing to do with the volume of sea ice at any given time. In fact, the Times is not just peddling ignorance, it is recycling it. Today’s Times piece is paraphrased from a much-derided column by Gail Collins that ran in October 2014. Like the other manifestations of climate hysteria, the walrus crisis is entirely fabricated. First, let’s note how great it is that you can find 35,000 Pacific walruses in one place. It is a sign of a thriving wildlife population, estimated to have doubled since the 1950s. The attempts by WWF and others to link this event to global warming is self-serving nonsense that has nothing to do with science… this is blatant nonsense and those who support or encourage this interpretation are misinforming the public. To be fair, misinforming the public is the Times’s specialty. The Times’s claim that “[t]he first time this happened was in 2007″ is a hilarious bit of ham-handed ignorance. If you want to learn a whole lot more about the walrus behavior in question, go here. Because its writers are so ill-informed, the New York Times is an especially laughable purveyor of politically-motivated climate hysteria. But in reality, the whole warmist enterprise is one big fraud, as is demonstrated on a daily basis.